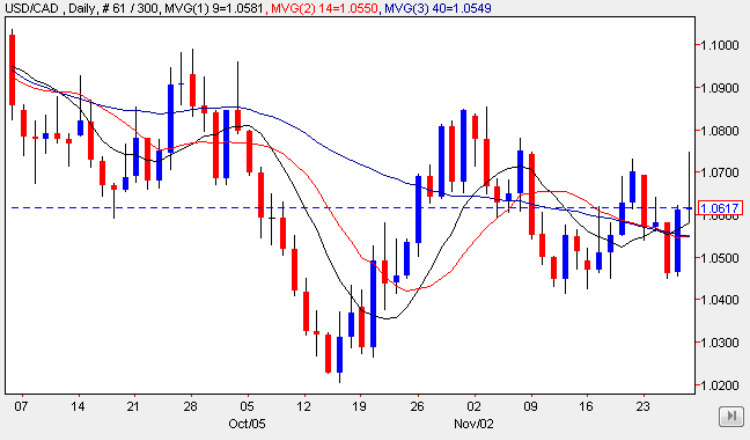 As with many other markets, and indeed several other currency pairs, the usd to cad suffered some extreme volatility on Thursday and Friday as the markets traded through the Thanksgiving holiday, with the thin volumes reacting to the merest hints of rumour and speculatio This resulted in Thursday’s flight to the safe haven status of the US dollar, generally being reversed on Friday as traders shambled back to work ( or in most cases went shopping) ahead of the weekend. Friday’s candle is perhaps more significant, suggesting further bearish sentiment in the usd to cad pair as a result, with the deep shadow to the upper body an ominous omen, and indicating that we will almost certainly see a fall in the usd to cad in the early part of the week, with the shooting star candle negating any positive sentiment from the previous day, and a break below 1.04 will open up the way once again for a move lower to retest the 1.02 support region, and should this fail to hold, then parity is on the horizon once again. Today’s significant fundamental news for Canada has been the release of the GDP figures which came in on target at 0.4%, the RMPI which came in below expectation at 2.5% and the IPPI which also came in below forecast at -0.3%. Meanwhile in the US the Chicago PMI came in above expectation at 56.1 against a forecast of 53.4.